Conference services managers; audiovisual equipment; complimentary Wi-Fi. and Ozarks National golf courses; Lost Canyon Cave and Nature Trail; Ancient Ozarks Natural History Museum; Fun Mountain adventure center; Bass Pro Shops Shooting Academy; Table Rock Lake fishing and boating; hiking; biking; sand volleyball; shuffleboard; mini golf; kids’ club activities; and a wide choice of food and beverage experiences. Table Rock Lake, rolling hills, and the Missouri sky set off the tapestry of cedars, oaks, and sugar maples at Big Cedar Lodge. 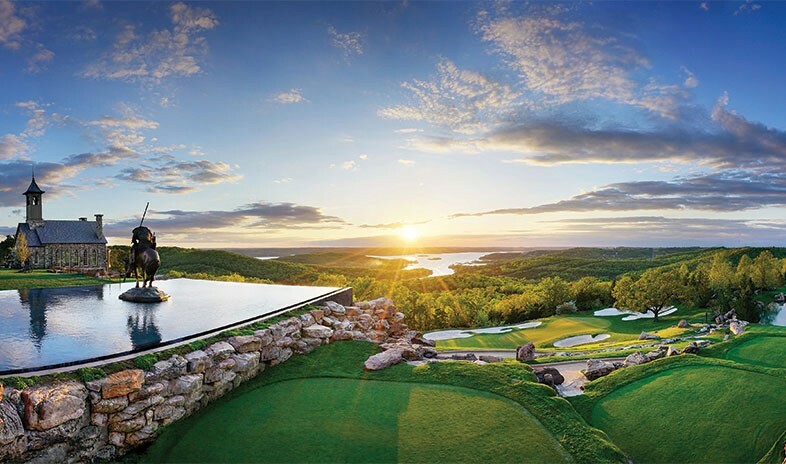 Ideal for incentives and corporate meetings of up to 1,000 guests, the resort occupies a prime heartland location in southwest Missouri, 10 miles south of Branson. The rustic charm of the banquet rooms and Grandview Conference Center comes with complimentary Wi-Fi and state-of-the-art meeting technology. In addition to banquet services, Big Cedar and its attractions offer numerous restaurants, each featuring stunning views of Table Rock Lake. Beyond the boardroom, guests can experience unbelievable activities, including four legendary golf courses, a world-class spa, a drive-through nature trail and cave, a 10,000-acre nature park, sport shooting facilities, an immersive aquarium and museum, and a 50,000-square-foot adventure center with an arcade, billiards, and an underwater-themed bowling alley. An intriguing menu of corporate team-building options promises to engage, energize, and educate with challenges such as property-wide scavenger hunts and fishing tournaments. The stables at nearby Dogwood Canyon organize trail rides, wildlife tram tours, and evening chuck wagon dinners, letting groups journey back in time. Since Big Cedar is within a day’s drive for over half of the U.S., these activities and much more are easily accessible for any gathering. Fishing was off the charts! Food was excellent and the customer service was awesome.